Piano Part. Note: 2 measures of quarter-notes have been prepended to the play-along to facilitate synchronization. Auf Christi Himmelfahrt allein (On Christ's ascension into heaven alone), BWV 128, is a church cantata by Johann Sebastian Bach. Bach composed it in Leipzig for the Feast of the Ascension and first performed it on 10 May 1725. Bach composed the cantata in his second year in Leipzig for the feast of the Ascension. The prescribed readings for the feast day were from the Acts of the Apostles, Jesus telling his disciples to preach and baptize, and his Ascension (Acts 1:1–11), and from the Gospel of Mark (Mark 16:14–20). In his second year in Leipzig, Bach had composed chorale cantatas between the first Sunday after Trinity and Palm Sunday, but for Easter returned to cantatas on more varied texts, possibly because he lost his librettist. Nine of his cantatas for the period between Easter and Pentecost are based on texts of Christiana Mariana von Ziegler, including this cantata. Bach later inserted most of them in his third annual cycle, but kept this one and BWV 68 for Pentecost in his second annual cycle, possibly because they both begin with a chorale fantasia like the chorale cantatas, whereas many of the others begin with a bass solo as the vox Christi. The poetess, who has a tendency to express a personal view, writing in the first person, took the theme of the cantata from the first stanza of Ernst Sonnemann's chorale after Josua Wegelin (1636): once Jesus ascended to heaven, there is nothing left to keep me on earth, as I am promised to see him "from face to face", a paraphrase of 1 Corinthians 13. In movement 2 she alludes to the Transfiguration of Jesus (Matthew 17:4), movement 3 sees the incomprehensible power of Jesus everywhere, not restricted to a certain location. He will lift me to his right hand, according to Matthew 25:33, and judge me right, according to the closing chorale, the fourth stanza of Matthäus Averius' "O Jesu, meine Lust". Ziegler's text in its printed version of 1728 and the cantata text differ, possibly changed by Bach himself. For example an aria and recitative are combined to one movement by inserting "wo mein Erlöser lebt" (where my redeemer lives) as a connection. In the opening chorus the chorale on the melody of the German Gloria "Allein Gott in der Höh sei Ehr" by Nikolaus Decius is embedded in an orchestral concerto. The cantus firmus is in the soprano in long notes, whereas the lower voices engage in imitation. Bach derived the highly figurative motifs of the instruments from the chorale tune: both a signal played first by the strings and oboes, then the two horns, then a fugue subject. Both motifs contain notes from the first line of the tune in the same order as in the tune, the signal contains the first five notes, the fugue subject all nine notes. Bach uses the trumpet, the royal instrument of the Baroque, only in movement 3 to symbolize the reign of Jesus. The trumpet appears first in the ritornello, which is repeated by the voice and again with the voice embedded. After a middle section, the first part of the aria is not repeated da capo; instead the added line is set as a recitative accompanied by strings, followed only by a repeat of the ritornello. The following duet is of intimate character. The obbligato instrument is the marked "organo" in the score, but the part is written in the oboe part. 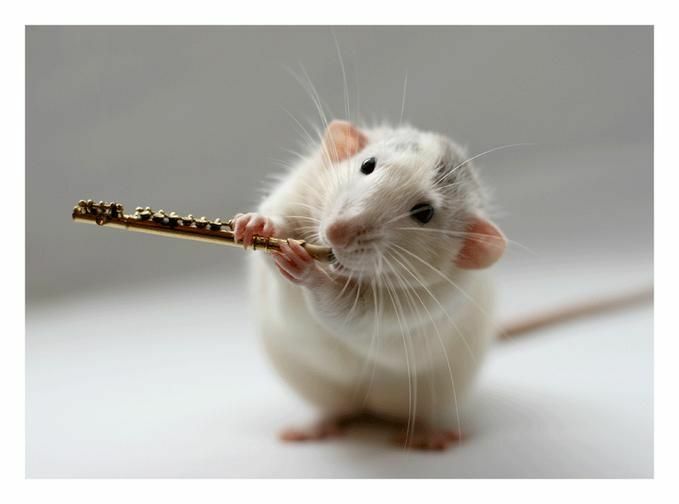 Due to the range, only an oboe d'amore can play it. Possibly Bach changed his intentions already while writing the part first, or he may have changed the marking later. Max Reger used the movement's ritornello theme for his Bach-Variationen Op. 81. The cantata is closed by a four-part chorale, most instruments playing colla parte, while the horns play different parts because of their limited range. 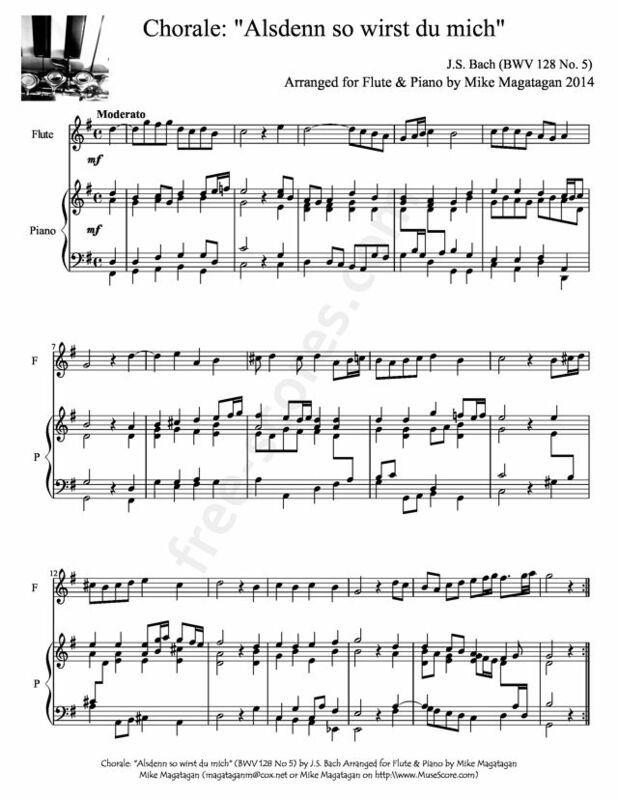 Although originally scored for three vocal soloists, alto, tenor and bass, a four-part choir, two horns, two oboes, oboe d'amore, oboe da caccia, two violins, viola and basso continuo, I created the arrangement for Flute & Piano.